Knee pain affects an estimated 25% of the adult population aged 50 years and over. Osteoarthritis is the most common diagnosis made in older adults consulting with knee pain in primary care. However, the relationship between this diagnosis and both the current disease-based definition of osteoarthritis and the regional pain syndrome of knee pain and disability is unclear. Expert consensus, based on current evidence, views the disease and the syndrome as distinct entities but the clinical usefulness of these two approaches to classifying knee pain in older adults has not been established. We plan to conduct a prospective, population-based, observational cohort study to investigate the relative merits of disease-based and regional pain syndrome-based approaches to classification and prognosis of knee pain in older adults. All patients aged 50 years and over registered with three general practices in North Staffordshire will be invited to take part in a two-stage postal survey. Respondents to this survey phase who indicate that they have experienced knee pain within the previous 12 months will be invited to attend a research clinic for a detailed assessment. This will consist of clinical interview, physical examination, digital photography, plain x-rays, anthropometric measurement and a brief self-complete questionnaire. All consenting clinic attenders will be followed up by (i) general practice medical record review, (ii) repeat postal questionnaire at 18-months. The current consensus of expert opinion is that "it is important to separate conceptually the disease process of osteoarthritis and the syndrome of musculoskeletal pain and disability" . Given that classification is "arguably one of the most central and generic of all our conceptual exercises"  and that "all our activities in public health, in epidemiology, and in clinical practice depend on the way we classify, recognize, and identify diseases"  this issue deserves attention. The disease of osteoarthritis (OA) is considered to be an active process involving the entire synovial joint with both degenerative and repair processes. It has multiple determinants that differentially affect incidence and progression , and may not comprise a single uniform disease but several (e.g. tibiofemoral vs patellofemoral; isolated knee vs generalised OA). It has been argued that "from a clinical perspective, the most compelling definition of (the) disease (of osteoarthritis) is one that combines the pathology of disease with pain that occurs with joint use" (termed "symptomatic knee OA") . Symptomatic knee osteoarthritis (OA) affects an estimated 10–12% of the adult population aged 55 years and over  with an annual rate of radiographic progression of approximately 3–4% [7, 8]. However, there are grounds to doubt whether this definition is, in fact, the basis for using the diagnostic label of "osteoarthritis" in primary care, where it is one of the most common diagnoses made in older adults . Current guidelines discourage the routine ordering of x rays to confirm a diagnosis of OA  making it unlikely that the 'pathology' has been verified in many cases. Although plain x-rays may be ordered by primary care clinicians, the decision to do so appears to be determined less by clinical features at the point of presentation as by provider characteristics and other considerations such as patient expectations of a diagnosis or a predetermined management plan [11, 12]. Knee osteoarthritis in practice may be better characterised as a "preference-sensitive" diagnosis (with respect to clinicians' and patients' preferences) that will include a combination of radiographically verified symptomatic knee OA and non-radiographic knee pain in older adults which is given the same diagnostic label . The effect of using such a 'mixed' approach to OA classification in practice on the accuracy of prognoses or the effectiveness of management is unclear. However, it cannot be assumed that adopting a more rigorous approach to diagnosis using only the disease-based definition of symptomatic knee OA would be an improvement although much of the current evidence for the effectiveness of interventions has been based on participants defined in this way. One proposed alternative to disease-based classification is instead to view knee pain in older adults (with the possible exception of severe OA) as a regional pain syndrome  in which psychosocial rather than pathoanatomical features contribute to variance in symptom severity and disability [1, 15]. This observation alone, however, does not provide direct evidence about exactly how such an approach might be implemented in practice nor how useful this might be. The debate on the relative merits of disease-based and regional pain syndrome-based approaches to classifying and diagnosing knee pain in primary care is also found across a range of other musculoskeletal pains [e.g. [16–18]]. The general aims of the cross-sectional component of this study are to investigate the relative usefulness of disease-based and regional pain syndrome-based approaches to classifying knee pain in older adults and to develop simple assessment tools that are clinically practicable for the primary care setting. We have taken our starting point as knee pain in older adults in the general population to reflect the diagnostic challenge in primary care where the presentation of undifferentiated symptoms is common . This starting point encompasses a larger proportion of older adults in the general population – approximately 25% of those aged 55 years or over experience knee pain that has lasted four weeks or longer at any given point in time . • What is the association between symptomatic radiographic knee OA and chronic knee pain? Does this association differ between tibiofemoral joint (TFJ) and patellofemoral joint (PFJ) OA? • Can simple clinical signs and symptoms accurately identify symptomatic radiographic knee OA in older adults with knee pain? • How does the distribution of other clinical features (e.g. signs and symptoms indicative of periarticular pathology), coexisting hand OA and non-clinical characteristics (e.g. psychosocial factors) compare between symptomatic radiographic knee OA and other knee pain? • In what respects do consulters and non-consulters differ in their characteristics at baseline? • How does a GP diagnosis of "knee osteoarthritis" relate to disease-based and regional pain syndrome-based classification? It has been argued that deciding what to do about a problem is often of more interest to clinicians and patients than what to call it . Accurate information on the likely future course will play an important role in the decision-making of both parties. Classifications of knee pain at a single point in time, whether on the basis of a disease or regional pain syndrome approach, need to be qualified by descriptions of their subsequent course over time. Such prospective studies offer the potential of describing intra- and inter-individual changes, investigating mechanisms to explain these changes, and forecasting change or outcome [21, 22]. The current study has been designed with attention to previously published requirements for reporting longitudinal studies in rheumatology [23, 24]. • What proportion of this sample consult their general practitioner for knee pain within the follow-up period? Can this be predicted by clinical and/or non-clinical variables collected at baseline? • How common is clinical deterioration (in terms of increasing pain/disability severity) in this sample? Can it be predicted? • What is the relative contribution of disease-based, clinical, and regional pain syndrome-based variables as prognostic markers? 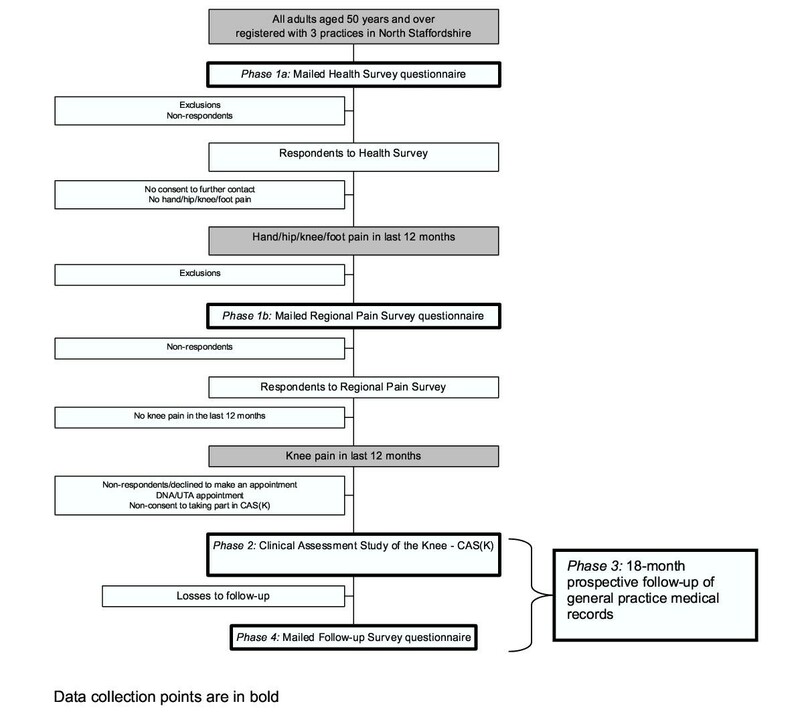 A population-based prospective observational cohort study in four phases will be completed in a sample of patients, aged 50 years and over, registered with three local general practices (Figure 1). Ethical approval for all phases of the study has been obtained from the North Staffordshire Local Research Ethics Committee with Phases 1 and 2 complete as at October 2003. The organisation and content of Phase 1 is the same as that described in a separate cohort undertaken in three separate practices in North Staffordshire . This consists of a mailed "Health Survey" questionnaire to all adults aged 50 years and over registered with the participating practices. Respondents who provide written consent to further contact and who report pain or problems in the hands, or pain in the hips, knees or feet will be sent a second questionnaire (the "Regional Pain Survey" questionnaire). These two questionnaires include measures of sociodemographic characteristics, general health status, psychosocial and lifestyle variables, and pain and disability (general and site-specific). Non-responders to each questionnaire will be sent a reminder postcard at two weeks and a repeat questionnaire at 4 weeks. Respondents to the Regional Pain Survey questionnaire who report experiencing pain in or around the knee within the last 12 months and who provide written consent to further contact will then be sent a letter of invitation and a Patient Information Sheet outlining the CAS(K) and the details of reimbursement for their travel to the clinic. Participants will be asked to telephone the Research Centre if they are interested in taking part to book an appointment. Non-responders to this initial invitation letter will be sent a reminder invitation approximately one week later. Participants who consent to telephone contact will be telephoned, with a reminder letter being posted if telephone contact is not established after attempts on three different days. Those willing to take part in the CAS(K) will be booked into the next convenient appointment and, if necessary, travel arrangements (taxi) made. Participants who do not attend the clinic for their specified appointment will be sent another letter asking them to re-contact the Research Centre and book another appointment if they still wish to participate. Assessment clinics for the CAS(K) will be conducted twice-weekly in the Rheumatology and Physiotherapy out-patient departments of a local National Health Service Trust Hospital. A maximum of 19 appointments per week are scheduled. Each clinic is to be staffed by a Clinic Co-ordinator, a Clinic Support Worker, three trained Research Therapists acting as Assessors, and two Radiographers. On arriving at clinic participants will be issued with a file containing all assessment documentation marked with their unique study number. Prior to commencing the assessment, the procedures outlined in the Patient Information Sheet will be discussed with participants to give the opportunity to ask questions. Written informed consent to take part in the CAS(K) study will be obtained from all participants. Appropriate clothing (shorts) for the assessment are to be provided. Participants will undertake the following standardised assessment: digital photography of the lower limbs and hands, clinical interview and examination of the knees and hands, plain radiography of both knees and both hands, simple anthropometric measurement and brief self-complete questionnaire. Each participant's visit is expected to last approximately 1 1/2 hours. A total of four photographs will be taken of each participant by an Assessor using a digital camera (Olympus Camedia C-4040 ZOOM: resolution 2272 × 1704 pixels). In static standing, anterior and posterior views of the lower limbs (waist to feet inclusive) will be taken. The dorsal aspect of each hand and wrist is also to be photographed. Photographs will be taken according to pre-defined written protocols that include standardised positioning of participants. To preserve anonymity participants' faces will not be included in any of the photographs, their unique study number instead being placed in each frame. Digital photography will take approximately 10 minutes to complete for each participant. Radiographs of both knees and both hands are to be obtained for all subjects. Imaging of the tibiofemoral joint of the knee will be undertaken using weight-bearing semiflexed (MTP) posteroanterior (PA) view according to a defined protocol . The patellofemoral joint of the knee will be imaged with the lateral and skyline view, both in a supine position with the knee flexed to 45°. Dorsi-palmar views of the hand and wrist are to be performed. X-rays will take approximately 20 minutes to complete for each participant. Participants will be interviewed and examined by a trained Assessor blinded to the findings from radiography and digital photography. This procedure will comprise three components. Firstly, a standardised clinical interview for the knee problem will be conducted using an abbreviated version of the KNE-SCI  – a structured, standardised interview developed to gather quantitative data on clinically relevant aspects of knee problems in older adults. Questions are directed principally at the participants' most problematic knee (index knee) and cover aspects of the history of knee problem, current knee symptoms, family history of joint problems, patient causal and diagnostic attribution, and selected current and previous treatment. Secondly, a brief, standardised, screening examination of both hands will be conducted. This will include identifying deformity, nodes or bony enlargement, and swelling at target joints as specified by the American College of Rheumatology criteria for classification of hand OA . Participants will also be asked to complete a test of maximal gross grip strength using a Jamar dynamometer (Sammons Preston, Chicago, IL) and pinch grip strength using a B&L pinch gauge (B&L Engineering, Tustin, CA). Thirdly, a standardised physical examination of both knees will be conducted. This will include tests of swelling, patellofemoral joint compression, range of movement, bony enlargement, superficial point tenderness, joint laxity, maximal knee extensor and flexor strength, crepitus, and single-leg standing balance. Pre-defined protocols for all components of the interview and examination are to be used for standardisation between Assessors. Assessment findings will be recorded on a standard form that is to be checked for missing data immediately post-assessment by the Clinic Co-ordinator or Clinic Support Worker. Discussion between Assessors and participants about diagnosis and/or appropriate management is to be discouraged. Participants will be advised to discuss clinical queries with their General Practitioner. The interview and examination will take approximately 40 minutes to complete for each participant. Weight (in kg) and height (in cm) of each participant are to be measured using digital scales (Seca Ltd., Birmingham, UK) and a wall-mounted measure (Holtain Ltd., Crymych, UK) respectively. During the clinic visit, participants will complete a brief self-complete questionnaire containing questions relating to their knee problem – days of pain, aching or stiffness in previous month, days in pain in the previous 6 months , episode duration , symptom satisfaction (adapted from ), and the Chronic Pain Grade  – and any hand problems – days of pain, aching or stiffness in previous month , hand dominance, previous hand injury, previous hand surgery. All questionnaires will be checked by the Clinic Co-ordinator or Clinic Support Worker following completion for any missing data. The questionnaire takes approximately five minutes to complete. Travelling and out-of-pocket expenses will be reimbursed after the assessment. The digital image memory card and all completed clinical assessment documentation and questionnaires will be returned to the Research Centre. Digital images are to be downloaded from the memory card onto a computer. A clinical report on the X-ray films will be provided by a Consultant Radiologist at the NHS Trust Hospital. The films and report are to be forwarded to the Research Centre where they will be screened by a Consultant Rheumatologist for any radiographic "red flags" or significant radiographic abnormality (see below). Standardised coding of radiographic features on the x-ray films will be carried out by a Clinical Rheumatology Research Fellow who will be blinded to the radiologist's report and all assessment data. Knee films will be scored for individual radiographic features, including osteophytes, joint space width, sclerosis, subluxation and chondrocalinosis. The Altman Atlas  and scoring system  are to be used for the PA and skyline views and the Burnett Atlas  for the lateral view. Additionally, PA and skyline views will be assigned a Kellgren and Lawrence grade . Consent forms, assessment documentation, x-ray films, and reports are to be placed in separate secure storage. Mandatory notification of clinical 'red flags': all participants will be routinely screened during the clinical assessment for signs and symptoms suggesting potentially serious pathology requiring urgent medical attention. These are: recent trauma to the knees or hands that may have resulted in significant tissue damage; recent sudden worsening of knee symptoms; and acutely hot, swollen, painful knees or hands . In the event of such findings, participants will be informed that they require urgent attention, a standard fax will be immediately sent to the General Practice, and appropriate medical attention arranged the same day. A letter of confirmation will be subsequently sent to the participants' General Practice. Mandatory notification of radiographic 'red flags': in the event of any radiographic red flags (including suspected malignancy, unresolved fracture, infection) reported by the Consultant Radiologist a standard fax will be sent with a copy of the x-ray report to the General Practice notifying them of this. This will subsequently be confirmed by letter. Availability of x-ray report on request: to prevent unnecessary duplication of x-rays, participants' General Practitioner can request the x-ray report if they feel it would be valuable for clinical management. Quality assurance and control are important for the integrity of longitudinal studies and the validity of their conclusions . This is especially true of observer-dependent methods of data-gathering. In the current study, the personal interview and physical examination, and the taking and scoring of x rays are subject to a number of quality assurance and control procedures. The clinical interview and physical examination have been pre-piloted. Inter- and intra-Assessor reliability of knee interview and examination variables have also been formally tested in three of the Assessors in a pilot study [, Wood et al., unpublished data]. All Assessors are required to conduct at least two clinical assessments prior to the commencement of data collection and during the first month clinics with reduced numbers of participants are to be held to allow all study procedures to be tested and reviewed. All radiographers participating in the study also receive training prior to the commencement of the study. The Clinical Rheumatology Research Fellow will be trained in the methods for scoring the plain radiographs. This single observer will score all films and intra-observer variability is to be assessed using 50 sets of films scored eight weeks apart. Inter-observer variability will be assessed using a second observer with prior experience of grading knee x-rays who will also grade 50 films. This inter-observer variability exercise is to be undertaken after a single consensus meeting. A detailed Observer Manual with protocols for obtaining written informed consent, digital photography, clinical interview and examination, administration of the brief self-complete questionnaire, anthropometric measurement, plain radiography will be provided to all members of the CAS(K) team for reference during the entire study period. During the data collection period, digital photographs for all participants will be reviewed and participants with any missing or spoilt images are to be recalled to repeat the photographs. Quality control sessions will be arranged with each Assessor after every 100 patients in total recruited to the study. These sessions include observation of assessments in clinic by the Principal Investigator, structured observation of assessment in a healthy volunteer, or direct inter-Assessor comparisons on selected patients. The outcome of each Quality Control session will be fed back to the individual Assessor and the group as a whole. Quality control sessions for plain radiography are also scheduled during the study to ensure consistency. All participants in Phase 1 who give permission for their GP records to be accessed will have their computerised medical records tagged by a member of the Centre's Health Informatics Specialist team. All consultations for the 12-month period prior to clinic attendance, and for the 18-month period following clinic attendance, will be identified. The three practices participating in this research are fully computerised and undergo annual audits completed by the Health Informatics team to assess the quality and completeness of the data entry at the practices. Data on consultations, medications, and referrals will be used to investigate patterns of primary and secondary health care utilisation within Phase 2 participants and compare these to Phase 1 participants who did not attend the research clinic. All sensitive data (name, contact details) will be removed from the medical records data and the consultation data will be linked to the survey and clinical assessment data by unique survey identifier. A follow-up survey will be mailed to all Phase 2 participants 18 months after their baseline clinical assessment. The focus of follow-up will be on clinical (pain/disability severity) change and possible determinants of this. The proposed content of this survey is provided in Table 1. Primary outcome data will be sought from non-respondents by telephone. Participants who have moved practice during the follow-up period will be traced using NHS tracing service and their new general practitioner will be asked for permission to include them in the follow-up. §also gathered at baseline. ‡ Minimum data to be sought by telephone from non-respondents. The sample size for this study was determined by the estimated numbers of participants needed in Phase 2 to ensure sufficient power for both cross-sectional and longitudinal analyses. A target sample of 800 was set. We estimate that 90 participants (12.5%) will report clinically significant deterioration over the 18-month period. With this number of participants, we will have 80% power to detect a rate ratio of 1.8 or greater with a minimum 64% exposure rate (e.g. presence of radiographic OA) in those who have deteriorated, at 95% level of confidence. Linking data collected at the clinical assessment with that from the 18-month follow-up questionnaire, we will be able to determine prospectively the factors that are related to clinical deterioration using risk ratios and associated 95% confidence intervals. The Knee Clinical Assessment Study is a prospective, population-based, observational cohort study based in North Staffordshire that intends to investigate issues surrounding the classification and course of knee pain and knee osteoarthritis in community-dwelling adults aged 50 years and over. The findings of this study will contribute new evidence to the debate on the relative merits of adopting a disease-based and a regional pain syndrome-based approach to understanding and managing this complaint. This study is supported financially by a Programme Grant awarded by the Medical Research Council, UK (Grant Code: G9900220) and by Support for Science funding secured by North Staffordshire Primary Care Research Consortium for NHS service support costs. KD is supported by a grant from the Arthritis Research Campaign. The authors would like to thank the administrative and health informatics staff at Keele University's Primary Care Sciences Research Centre, staff of the participating general practices and Haywood Hospital, especially Dr Jackie Sakhlatvala, Carole Jackson and the Radiographers at the Department of Radiography. All authors participated in the design of the study and drafting the manuscript.